By Ashford Development Association Ltd.
We await our request of an Oral Hearing at An Bord Pleanála. Thank you all for your support. Look into Rivervartry.com to see the progress and if you have a chance to come to an Oral Hearing. We are in favour of Upgrading the Roundwood Treatment Works but not at the sacrifice of the Environment. This will set an ugly precedence for Irish Water to ignore other rivers and environmental issues. There is a way to serve both purposes. Improve our Water Infrastrutures and protect the River at the same time, only Irish Water do not want to "waste" the time. We don't consider it a waste of time and ask you to join us in this fight to make Irish Water and Wickow County Council understand that we care about our envirionment and want it protected for the future generations. Irish Water have been allowed to go ahead without the benefit of an Environmental Impact Assessment despite widespread objection from the Ashford Community and the River Vartry Protection Society who represent the Riparian Owners living beside the river. 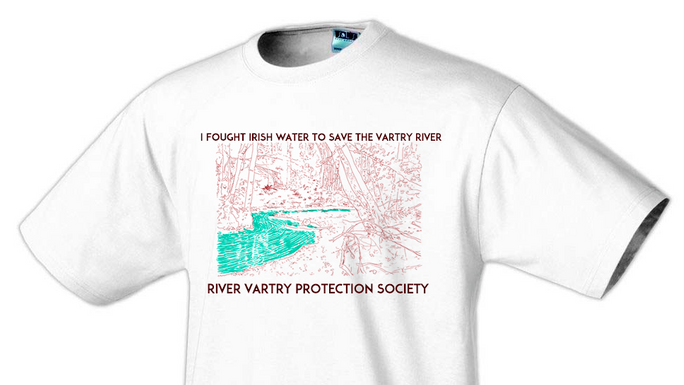 The River Vartry is an EU Protected Salmonoid River but even with that protection and the fish managing with the current lack of water, their plan will reduce the water flowing in the River Vartry by 2/3 its current flow. The EU River Basin Management Document requires the government to negociate "Compensatory Flows" for the river, but instead of getting more water, we are going to get 1/3 of the current flow. We have lodged an Appeal to An Bord Pleanála in order to save the River Vartry. We have used up all of the first €3500 on our Barrister, our Ecologist and our Fisheries experts. This has been well spent and on the 19th of December we lodged the Appeal. Both Mount Usher Garden and the Vartry Conservation and Angling Club entered Appeals in their own rights. INLAND FISHERIES IRELAND has also added their own Appeal to ours so this is a strong objection to what is happening. There have been three or four objections in support of our appeals and this brings forward the realisation that this is a major regional and local issue. Mount Usher Gardens are displaying signs and making the campaign visible. We need people from all over, speaking out and demanding that the need of the Environment be taken into account. If we destroy all our best rivers now, your children will be seeing Salmon, Sea Trout, Otters and all the other protected speices of the River Vartry in the Natural History Museum and posters of what was once.. The Appeal is strong and detailed. See RiverVartry.com for details on this. But as I say, this is just the first battle in a long war to secure the protection of the River. The costs of going to An Bord Pleanála have been paid, primarily due to all of your support. But we need to continue to Fund Raise as the War is not over. We have requested an Oral Hearing which is only given for very few circumstances. One circumstance is to be able to prove that this is of major public concern, so we need you to share this page as much as possible. If we are granted an Oral Hearing there will be new expenses for the Barrister and Experts to testify and cross-examine the Irish Water experts. We have just commissioned a new Study of what are the necessities to secure the environment for the Salmon. We are also thinking ahead and building a "War Chest" to fund eventually reaching the High Court and perhaps the Supreme Court, if things don't go well with An Bord Pleanála. We pledge that all funds we receive, without any administration cost, will be used towards saving and protecting the River Vartry. If we succeed, we will soon be back in Battle Two which will be to become a Stakeholder in making the Environmental Impact Accessment which the lack of, was our major concern. We hopefully will be able to negociate for a better deal for the River Vartry and to protect it into the future without going to the High Court. The Tee Shirts are now being delivered to those of you that asked. For donations of 25 euro and above, we have commissioned a high quality hand made tee shirt from a well-known Portugeese artist, Lucas Almeida. We are still deciding on the final design but here is a preview of the shirt. For contributions of 10 euro and above we will find something suitable for you as a gift reminder, but have not decided on exactly what as yet. Here is a picture of the top of the River Vartry by the Treatment Works. The whole of the river will look like this if Irish Water is allowed to go ahead with their plans. Please help by joining us in our fight. To read the latest news read our latest post at RiverVartry.com. 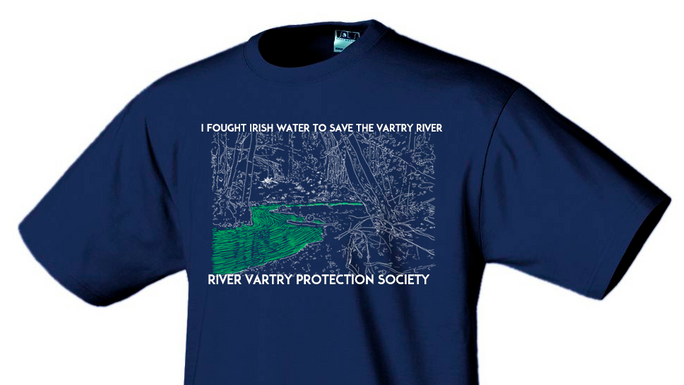 The River Vartry Protection Society would like to thank all our supporters for helping fund the effort to save the River Vartry. We now await a decision or oral hearing at An Bord Pleanala. We are offering as thanks a hand made tee shirt by a well-known Portuguese artist. You will get a tee shirt in either white or blue until we have another perk to replace this with. * €2,895 in offline donations included in total.